Monday, 25 March 2019, 5:33p.m. A Rūātoki grandmother has been found guilty of her eight-month-old grandson's manslaughter. The jury of seven men and five women were sent out to begin their deliberations at 11.45am today after Justice Sally Fitzgerald summed up the case. Donna Catherine Parangi, 54, had denied a charge of manslaughter of Isaiah Neil after he was left in a car while she and her daughter, Lacey Te Whetu, went into their house and smoked synthetic cannabis. Isaiah was discovered in the car by his father, Shane Neil, who had also been smoking the substance. 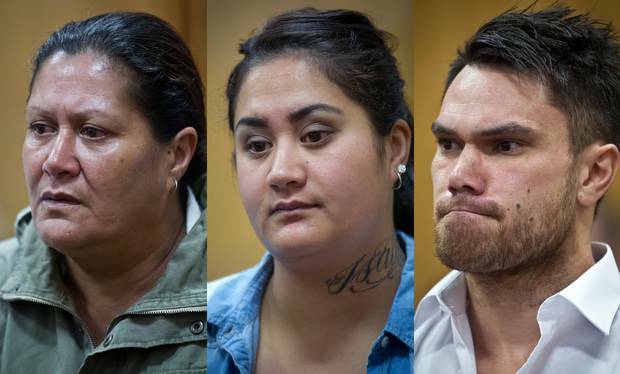 Neil and Te Whetu have already admitted charges of manslaughter in relation to their son's death. However, Parangi had denied any role in the baby's death. The crown said Parangi had told police in her formal interview that she had told her daughter to leave Isaiah in the car when they returned so that he could continue sleeping. The pair, along with Neil, then smoked synthetic cannabis. The crown's experts gave evidence that the baby died from heatstroke, or hyperthermia. Neil gave evidence about finding the boy lifeless and hot in the car and bringing him inside the house and handing him to his partner about 3.30pm. She then tried to give it a bottle before putting him to sleep in his cot. He then didn't wake up when Te Whetu tried to raise him about 6.30pm.